Fresh off their best offseason in recent memory, the Miami Dolphins look to make the transition from overachievers in 2012 to contenders in 2013. The Dolphins have certainly bolstered the roster with the additions of wide receivers Mike Wallace and Brandon Gibson and linebackers Philip Wheeler and Dannell Ellerbee among others. But while the new acquisitions rightfully stole the headlines, there was one very significant signing lost in the mix and it was that of quarterback Matt Moore. 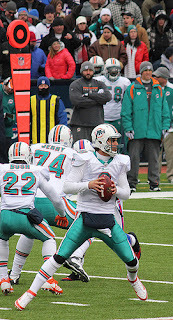 After a 6-3 finish to 2011 in which Moore threw three times as many touchdowns as interceptions, many projected Moore to be the starter in Miami in 2012. But after losing the starting job to rookie Ryan Tannehill, Moore had to settle for the job as Tannehill's backup. One common theory was Moore was a bad fit for Mike Sherman's offense, but Moore proved that he could still add value even if it came in a lesser role. In his only appearance of significance in 2012, Moore went 11-for-19 with 131 yards and a touchdown helping lead a 30-9 rout of the New York Jets. A free agent this offseason, Moore stuck with Miami rather than trying to compete for a starting job in a place like Arizona or Kansas City. What the signing of Moore does for Miami, however, has less to do with Moore himself and more to do with Tannehill. 6-6 in his career as a starter with the Dolphins, Matt Moore is an excellent insurance policy behind Tannehill. Joe Philbin, Sherman and the rest of Miami's coaching staff in 2012 was understandably hesitant to open things up completely for the rookie at the early stages of the season. While known for 6'4", 225-pound frame and his big arm, Tannehill's athleticism often gets overlooked. Many forget that before taking over the reins at quarterback at Texas A&M, Tannehill saw the field plenty as a wide receiver. It wasn't until the latter parts of the 2012 season that the Dolphins allowed Tannehill to use his legs as a weapon in addition to his arm. In the Dolphins' final six games of 2012, Tannehill averaged better than 30 yards-per-game on the ground while rushing for 6.5 yards-per-carry. Having Moore on the bench will allow Miami to use Tannehill's full arsenal by allowing more opportunities outside the pocket and in the zone-read game. Obviously neither the Dolphins nor their fans want anything to happen to Tannehill, but with the skill set he has, Miami cannot afford to relegate him to the pocket. No one will be urging Tannehill to lower the shoulder and take on opposing linebackers, but it would be foolish not to take full advantage of his athleticism. In today's NFL, the running quarterback is a weapon and the Dolphins have a weapon. After all, there's no one on the West Coast clamoring for San Francisco's Colin Kaepernick to spend more time in the pocket, and don't expect Mike Shanahan to try to turn Robert Griffin III into Dan Marino in Washington despite his recent knee injury. With an upgraded receiving corps that now includes Wallace, Gibson and last year's leading receiver Brian Hartline, it's entirely possible that there is less of a need for Tannehill to run. Conversely however, with a lack of experience and the largely unproven duo of Daniel Thomas and Lamar Miller in the backfield, there may be a greater need for Tannehill to become a more intricate part of the Dolphins' ground game. How often Tannehill takes off remains to be seen, but having Matt Moore on the bench should make the Dolphins and their fans breathe just a tad bit easier when he does. The Miami Dolphins: All Peaches and Cream...Not! Miami Dolphins: Moving Forward or Backward?